We put the customer at the center of all we do. 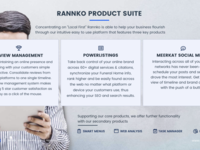 Rannko focuses on small businesses in six core industries: Restaurants, Salons & Spas, Hospitality, Legal, Healthcare, Dental, Funeral Space & Cannabis. 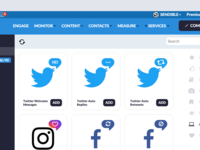 Our powerful social media management solution makes it easy for SMEs, corporate marketing teams and digital agencies to promote, analyze and track their brands across all social media platforms.